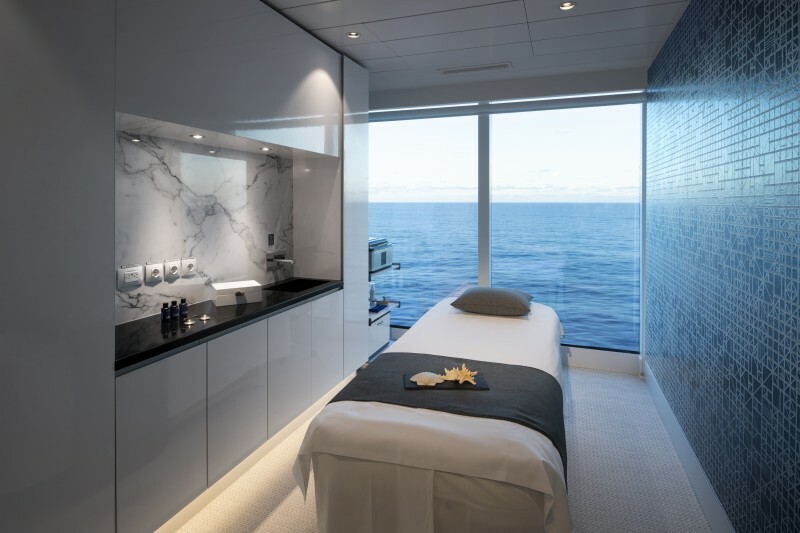 The most transformational aspect of Celebrity Edge’s stateroom design is the introduction of the Edge Stateroom with Infinite Veranda, where with the touch of a button, the entire living space becomes the veranda, letting guests walk right out to the water’s edge. 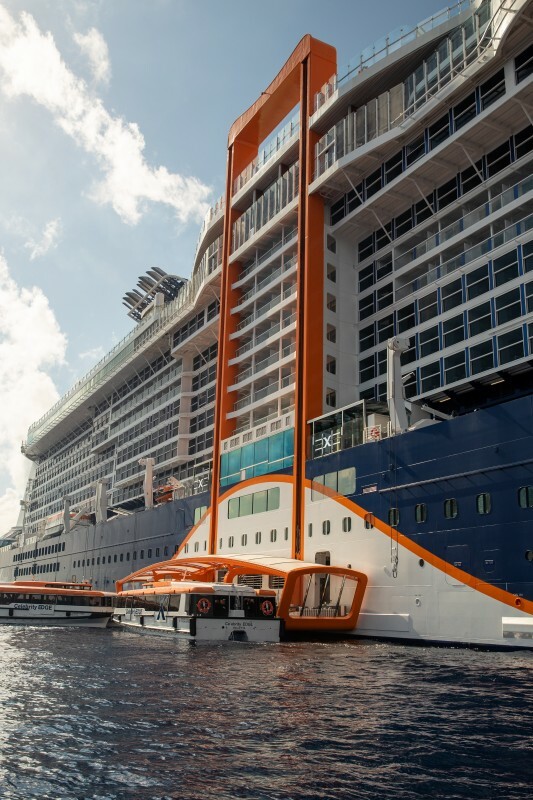 With each new cruise ship trying to out “wow” the former, I was surprised that the new Celebrity Edge could actually make my jaw drop. It’s not possible to fully experience this ship in a two-day preview cruise, but I’ll give you the highlights. Edge is like an art and design exhibit on the sea. You notice this instantly when entering the Italian piazza-inspired Grand Plaza on Deck 3, located at the heart of the ship and see The Chandelier, a light fixture and art installation that rises three decks above the Martini Bar, illuminated by LED strips that change color. 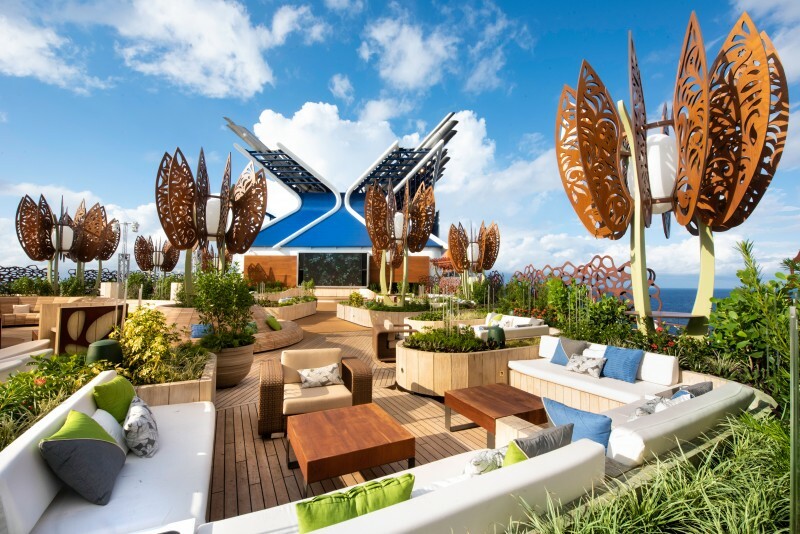 Once on Deck 2, Magic Carpet hovers within a hair above the ocean surface and becomes an extension of the Destination Gateway, a new area that becomes a luxury embarkation station where guests will be whisked away aboard the newly redefined Edge Launches. Another standout is the Magic Carpet, which they call a “transformative” venue and the world’s first “cantilevered floating platform.” The Magic Carpet moves along the ship’s exterior and reaches a height of 13 stories above sea level when moved to Deck 16. I think some guests, including myself, were under the impression that passengers could actually ride inside the Magic Carpet much like an elevator. I spoke with Harri Kulovaara, Executive VP, Maritime & Newbuilding, and unfortunately, due to safety reasons, that cannot be done. Still, the design is stunning and it’s a nice place to enjoy cocktails at sunset. Naturally, the spa would be a big hit with me, although I didn’t actually get to try any treatments. Simply stated, it’s gorgeous. In addition to a salon, barbershop, gym, and the usual heated tile loungers, aroma steam room, and rainfall water therapy room, there is a Crystalarium with stone walls that feature a healing amethyst crystal, Infrared Sauna Room, Float Zen Zone (with hanging basket chairs), Salt Room and Hamman Turkish Bath. 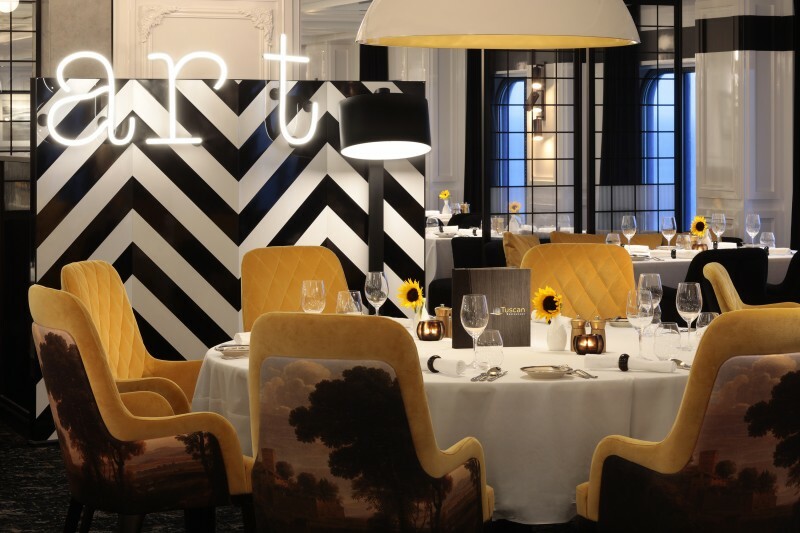 For more dining variety there are four main restaurants instead of one: Cosmopolitan (“new American with global influences”), Normandie (contemporary French cuisine), Cyprus (seafood and Mediterranean) and Tuscan (authentic southern Italian). There are also exclusive main dining restaurants Luminae at The Retreat for Suite Class guests and Blu for Aqua Class guests. In Tuscan Restaurant, offering southern Italian eateries, featuring all homemade pastas prepared with a rustic flare. More complimentary dining is available at Eden Cafe, Spa Cafe and Juice Bar, Oceanview Cafe, and Mast Grill. In addition to the Eden Restaurant, there are four other specialty restaurants at an additional cost: Le Grand Bistro, Fine Cut Steakhouse, Raw on 5 (a raw bar with oysters, crab, mussels, lobster) and Rooftop Garden Grill. Although I didn’t get to dine at Petit Chef and Friends, a dining experience at Le Grand Bistro, I got a demo of two courses. Le Petit Chef & Friends features four animated chefs that through projectors in the ceiling, stroll across the table, creating courses—very cute and entertaining, created by Skullmapping and presented by TableMation. Magic Carpet, when positioned on Deck 5, becomes an open-air extension of Raw on 5, offering select Raw on 5 favorites as well as its own menu. There’s also Dinner on the Edge for sky-high dining when Magic Carpet is on Deck 15. Reservations have to be made on board because dining availability is dependent on weather. 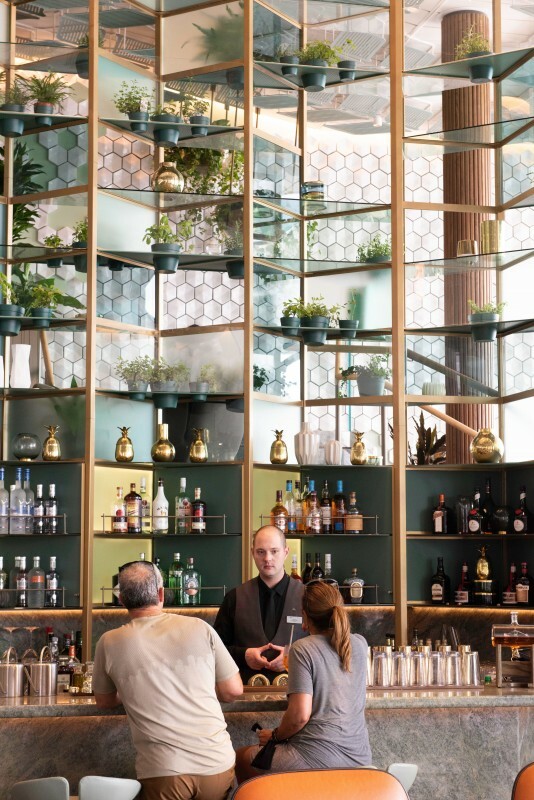 There are 11 bars and lounges, most notably the Eden Bar with its “Library of Plants” a living wall where fresh ingredients and garnishes are hand-picked for cocktails, and the Martini Bar, where bartenders display impressive and entertaining skills while crafting cocktails. The Theatre is high-tech with four stage areas, three giant moving projected backdrops, rotating spiral staircases, 18 synchronized projectors and more. I briefly stopped in for “Hype,” a musical performance, which was less like the Broadway-ish shows typically found on Celebrity, and more like a concert. Edge has the usual ship features like the Resort Deck with 25-yard lap pool (the largest pool in their fleet), two 2-story martini-shaped hot tubs, an adults-only solarium, Rooftop Garden (which will have concerts and films under the stars), a casino, shops, photo studio, a youth program, and entertainment throughout the ship. There seems to be a good number of programming meant to appeal to millennials through interactive “experiences,” like Club Andromeda with role-playing experiences where you can be someone else for one night, and Eve at Eden, where performers called Edenists, interact with guests and of course, also do special performances. 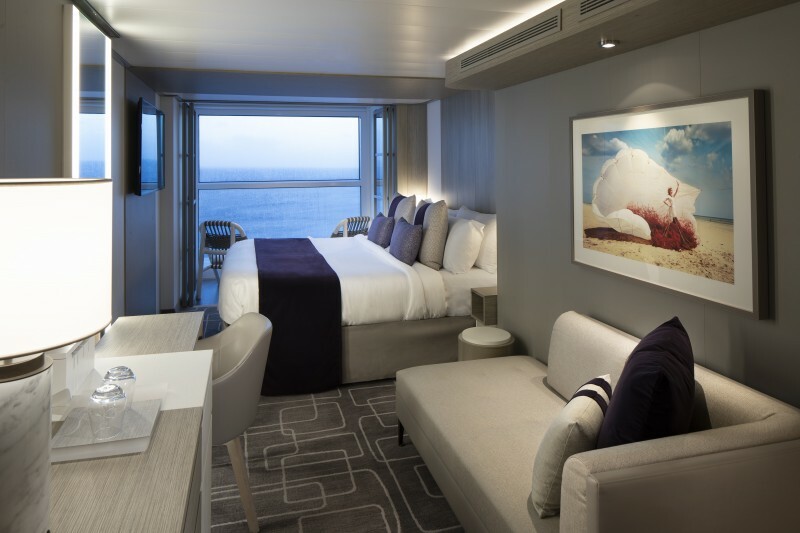 As for accommodations, staterooms and suites are designed by Kelly Hoppen. Some stateroom designs feature Infinite Veranda — verandas are more like an extension of the room. The staterooms are also 23% larger than Solstice class staterooms. There are also premium accommodations including massive Iconic Suites, and Edge Villas (two-story luxury residences). There is also The Retreat, available to Suite Class guests, with its own sundeck, Pool Butlers, private elevator, lobby, and lounge, among other things. 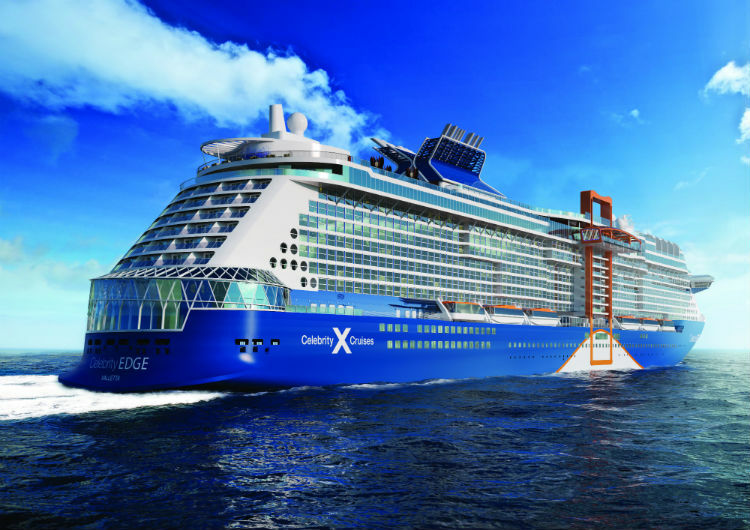 Celebrity Edge sails to the Western Caribbean and Eastern Caribbean and in the spring of 2019 will have 7- to 11-night sailings to the Mediterranean. For more information visit https://www.celebritycruises.com/edge. Gerrie Summers has been writing professionally for over 31 years in the areas of entertainment, beauty, lifestyle, travel, and wellness. 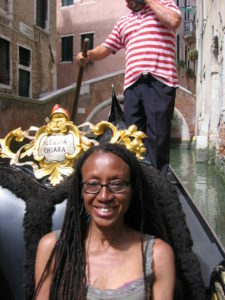 A New York-based writer, she has been the Travel Adventures columnist for Today’s Black Woman and now writes the blogs Summers Retreat and The Tranquil Traveler.